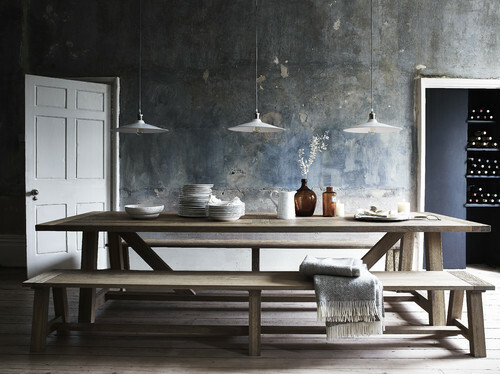 This month we were pleased to hear that we had been featured on the interiors website, Houzz. 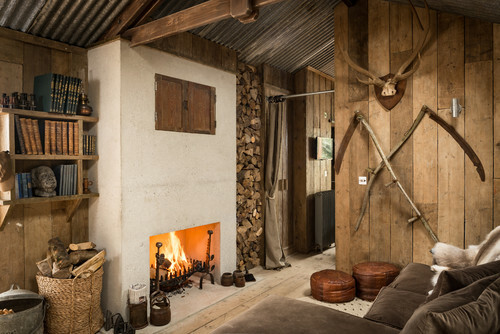 The article was about achieving a raw and rustic look, so no surprise they wanted to use an image by raw wood specialists Brandler London image. 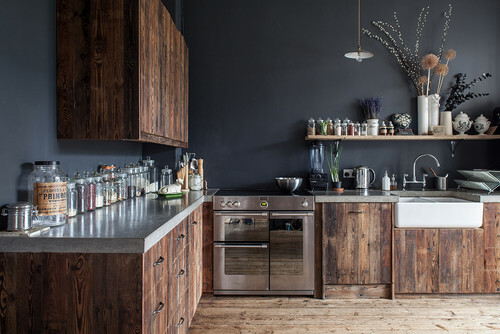 For the article, Houzz included our warehouse conversion based in Southwark. This project made use of existing raw wood joists and exposed brickwork, bringing new life but holding onto character. Alongside us, the article spotlighted other designers that were able to combine the use of natural and industrial materials into their designs. Giving helpful tips to create cozy yet contemporary living spaces. Projects featured included impressive uses of incorporating raw wood and metals into spaces that had exposed brickwork or distressed plaster. As well as making the most of your scuffed floorboards. We were able to keep to the Brandler style by placing raw aged pine alongside polished concrete worktops, creating a crisp and contemporary design. We were lucky enough to reuse the raw wood from the existing joist to create the cabinet doors. Pair this with the buildings exposed brickwork and our choice of a soft green for the walls, we were proud of how light and relaxing a living space we had achieved. 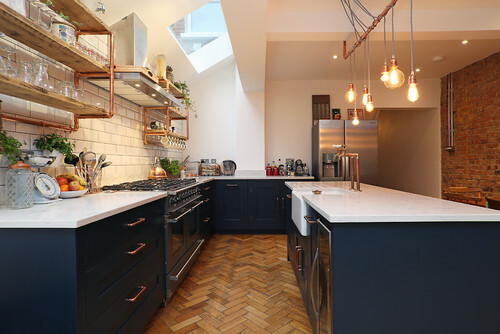 Other features of the design included recessed handles with routed steel back-plates as well as retrofitted lighting by Buster + Punch and fully fitted kitchen appliances. 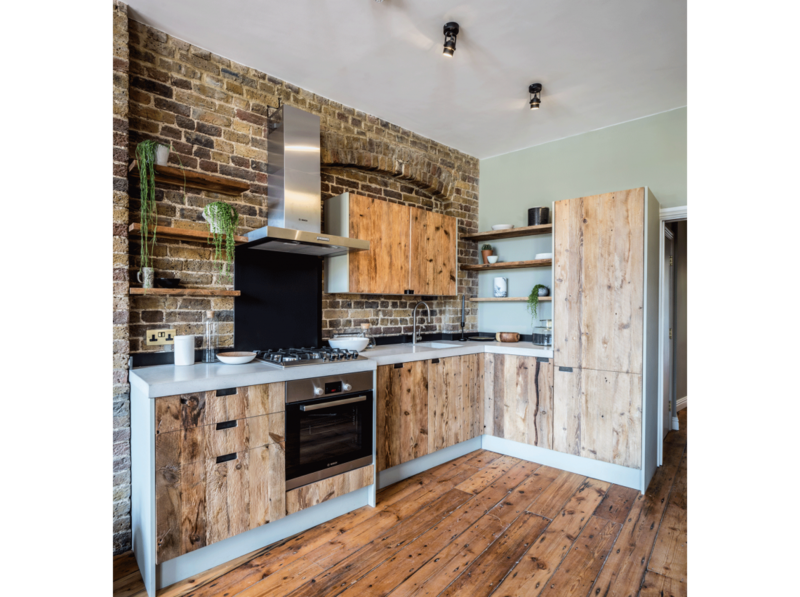 At Brandler, we pride ourselves on being makers of bespoke cabinetry, and our Southwark warehouse is another example of how good we are at working weathered barn wood into high-end contemporary designs. Please take a look at some other kitchen designs we have work on here.